GR8Analysis.com - A GR8 Solutions service. GR8 Analysis surveys are easy to use for participants and will deliver actionable insight to inform your decision making. GR8 Solutions is proud to offer DCAT, your web based data collection and analysis tool. DCAT provides you with the ability to efficiently collect and determine your clients wants and needs. Also, quickly deliver custom coupons or event notifications to your entire client base. We developed this feature with researchers in mind. Our analytics have never been so easy to understand. We take the necessary steps to ensure your data is secure. Researchers and Participants' data is securely transmitted to our server. Whether you're a researcher or a participant, building a simple or complex survey, you will find the DCAT a pleasure to use. Unlike others, we don't limit your potential. Limitless surveys, limitless possibilities. Our highly trained and dedicated team is standing by to help you out. Just give us a call. Make your mark with your company's information highlighted throughout the survey. Our designers take white label design to the next level. Our service is designed for researchers and participants on the go. Over 50% of surveys are completed on mobile devices. 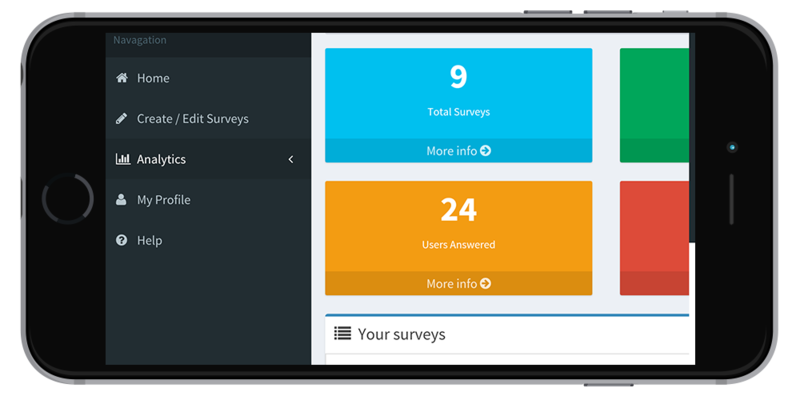 Send your surveys knowing they'll be stunning on any device, in every browser.